Numark, the world’s leading manufacturer of DJ technology, introduces N4, a four-channel DJ controller with built-in mixer. Numark will unveil N4 at booth F3 at BPM 2011 in Birmingham, England from October 1st – October 3rd. Featuring 4-decks of software control plus a built-in mixer that can be used with or without a computer, N4 is designed for DJs who want powerful capability in a lightweight, portable package. This complete 4-channel controller has everything DJs need to perform at their highest level: large, touch-sensitive platters, 4-decks of software control with loop and effects controls, a built-in USB audio interface and a comprehensive mixer section with EQ and gain. N4 will come with both Serato DJ Intro software and a 4-deck version of Virtual DJ LE. The N4 DJ controller with a mixer is built for flexible control of virtually any music source. 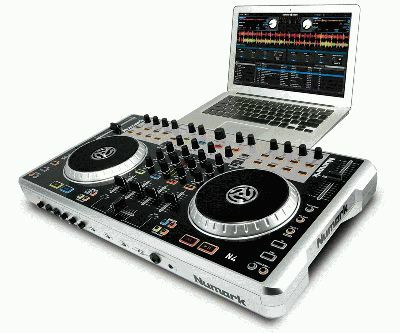 Its built-in DJ mixer allows DJs to mix any external source including turntables, CD players and MP3 players. DJs are able to instantly switch from controlling 4 decks of software to controlling 2 decks of software plus 2 channels of external source. With the ability to use time code, N4 sets a new standard for 4-channel DJ controllers in its class. In addition to 4-decks of MIDI software control, N4 gives DJs the ability to use their CD player or turntable to control advanced DJ software by employing turntables with time-coded vinyl or CD players with time-coded CDs.